My friend Brad loves all things classically beautiful, and his gimlet eye selects only the best. In fact, his fine honed sensibilities have enabled him forge a successful business based on historical and vintage images. 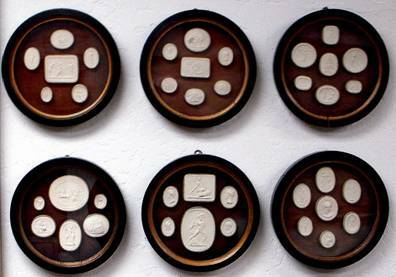 (see Cavallini & Co.) Curious and inquisitive, Brad instinctively searches archives and antique stalls to uncover the uncommon, unusual, and unique. 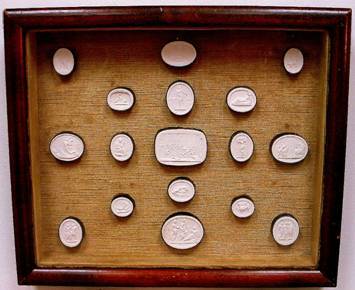 So it really came as no surprise that when gifted with a set of antique intaglios, he wanted to know more. 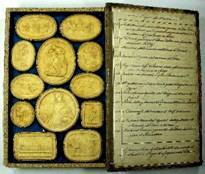 Beginning around 1650, young aristocrats embarked upon a rite of passage known as The Grand Tour, to enrich their education in art, architecture, history, languages, and culture. 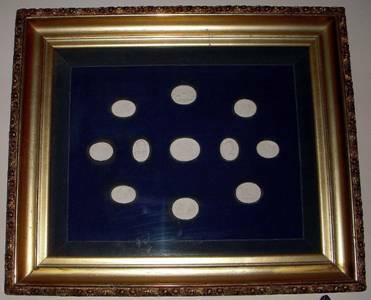 With virtually unlimited funds, they traveled throughout the European continent, commissioning paintings, purchasing antiques, and taking lessons in riding, fencing, music, history, culture, the classics and languages. A tour might include London, Paris, Switzerland, and particularly Italy – Turin, Florence, Pisa, Padua, Bologna and Venice. Ample time was spent in Rome to study the classics, then on to Pompeii, Vesuvius, and Naples. Longer sojourns might include Vienna, Dresden, Munich, Flanders, St. Petersburg, Madrid, etc. By 1840, advancements in rail transportation opened touring to the upper class, even including young women, as we saw in E. M. Forster’s novel A Room with a View. 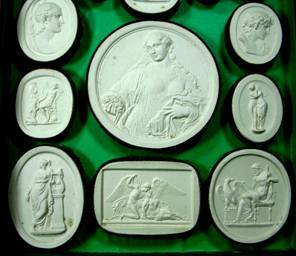 By 1820, merchants were offering plaster replicas of these cameos in all sizes. 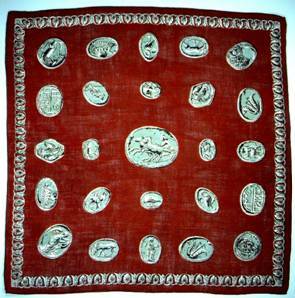 The plasters portrayed Greek and Roman deities, architectural details, mythological figures and religious iconography. 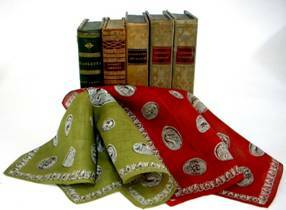 They could be purchased in book format as well. 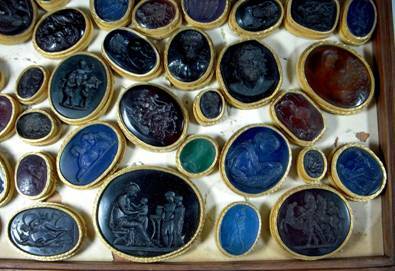 Brad’s interest was piqued, and he began collecting Grand Tour cameos. 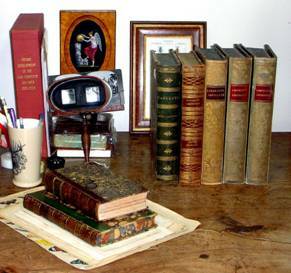 His office is filled with interesting treasures, but take a closer look at the ‘books’ on his desk. They’re souvenir tour tomes. Each one holds a wealth of surprises. 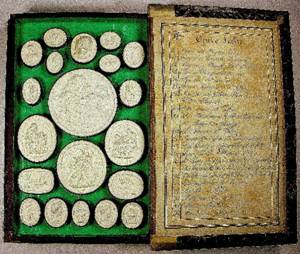 Some books delineate their provenance. 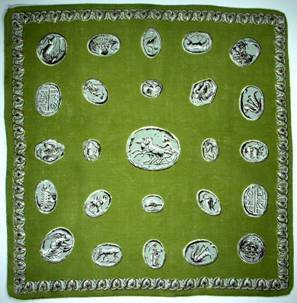 Needless to say I was thrilled to find these Grand Tour cameo handkerchiefs. Who knew? It’s delightful to be able to gift someone with something truly personal, and Brad loved these. 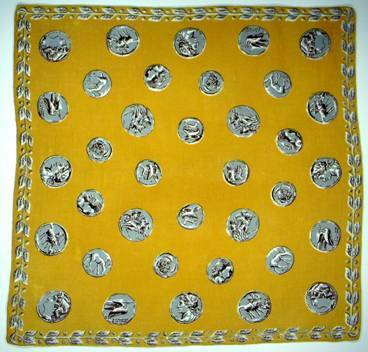 This golden hankie carries a blend of Roman coins and intaglio images bordered by olive branches. All images shown here are from Brad’s ever expanding collection. The moral of the story – if you keep your eyes peeled, it’s often possible to find the perfect gift for a special friend. It’s both extremely rewarding and just plain fun for both the giver and recipient. Brad is a very private person, but I couldn’t leave without giving you at least a peek at his warehouse showroom. 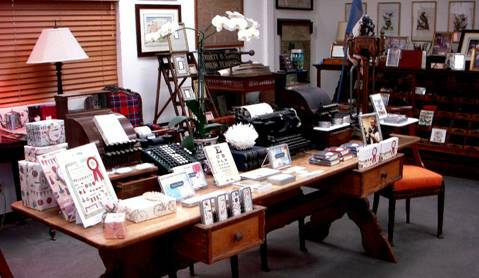 Products are displayed in, around, and among an eclectic mix of antiques and artifacts. 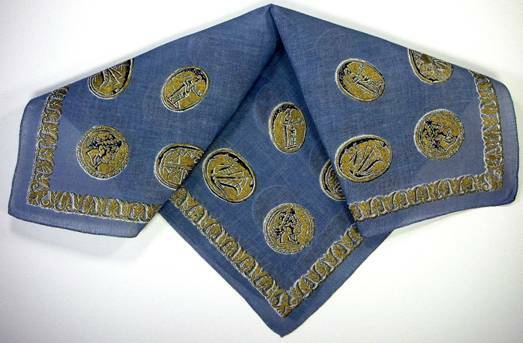 Hi- Can you tell me where you found these handkerchiefs?